BBC reports that an armed standoff ended peacefully earlier today at a Ukrainian facility near Sevastopol, described as ‘missile defence base A2355.’ According to earlier reports, a truck drove through the base’s gates, and around 20 attackers rushed through and threw stun grenades. The Ukrainian troops retreated to a bunker on the base’s grounds, and the base commander negotiated with the group of attackers until they agreed to leave. Journalists who attempted to cover the event were reportedly beaten by some of the attackers. It is unclear whether the attackers were Russian troops, or a paramilitary gang. 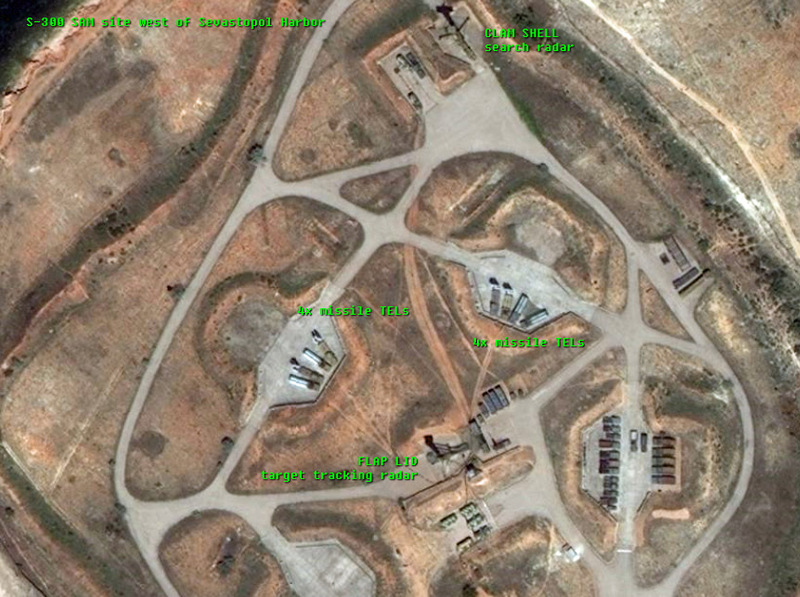 I am also trying to confirm if base A2355 is one of the S-300 surface to air missile batteries that defend Sevastopol. Meanwhile in Sevastopol Harbor, the New York Times reports that a Russian minesweeper and two tugs are blockading the Ukrainian Navy flagship, the frigate Hetman Sahaidachny, and two other vessels. Some sources report that the flagship defected to the Russian side, but as of this writing, that claim appears to be false. 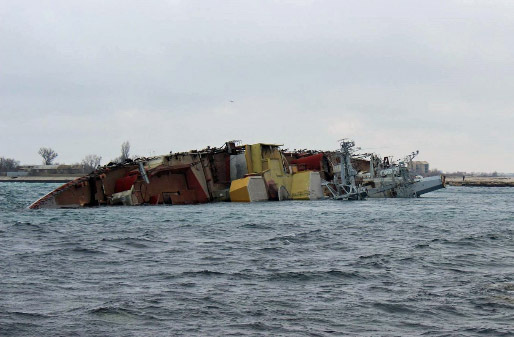 The Russian Navy also reportedly scuttled the hulk of the old cruiser Ochakov, to block the entrance to Donuzlav bay, bottling up some other Ukrainian Navy ships. The rumors about the Russian deadline for Ukrainian troops in Crimea to surrender by 0300 GMT today were false, or the Russians decided not to follow through. 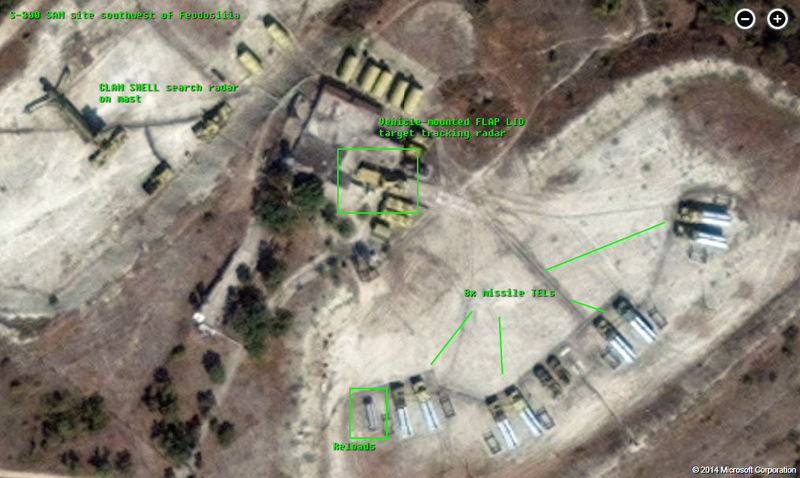 Russian troops continue to surround Ukrainian bases in Crimea, and have settled into a tense standoff. BBC posted a video showing members of the Ukrainian 67th Fighter Regiment as they tried to access Belbek Airbase, but were turned back by Russian troops and pro-Russian irregulars surrounding the base. You can briefly see that some of the MiG-29 fighters are still at the airbase and haven’t been evacuated to the Ukrainian mainland. Russian News Agency Interfax is quoting a source in the Ukrainian Defense Ministry, that the Russian Black Sea Fleet demands Ukrainian forces in Crimea stand down by 0300 GMT Tuesday, or they will risk a direct assault on their bases. The statement hasn’t been confirmed by either side, and I am skeptical. I don’t think Russian forces need to escalate further at this point – they already control Crimea, and if the standoff turns into a shooting war the result is going to spin out of control very fast. At this point the Russians can continue to claim they are acting to protect the safety of ethnic Russians in Crimea, but that fig leaf will be torn away if Russian forces become the aggressors. Though news sources are reporting the arrival of reinforcements over the weekend, I also question whether Russia has enough troops and equipment on the ground to guarantee a successful assault through overwhelming force. Some of the reasons Russian President Putin is willing to gamble heavily on gaining control of Crimea include the territory’s strategic geography, and also the heavy militarization of the peninsula and the location of existing strategic assets in Crimea. 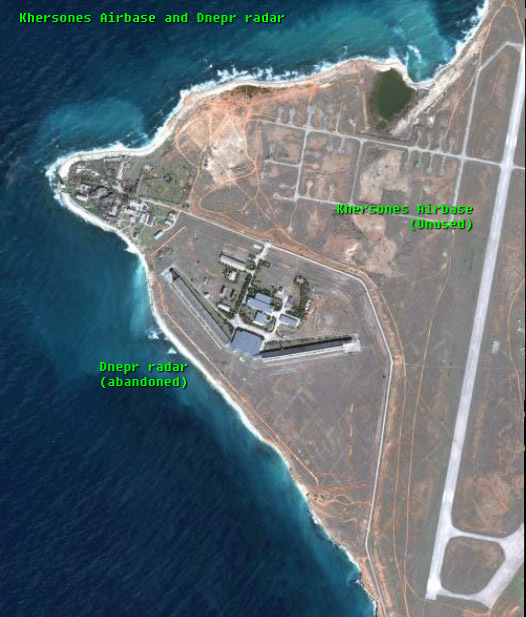 This post will take a close look at some of those assets using commercial satellite imagery. Be aware that these images are likely more than a month old, since commercial imagery sites are not updated often. They do not represent the rapidly-evolving situation currently on the ground in Crimea. 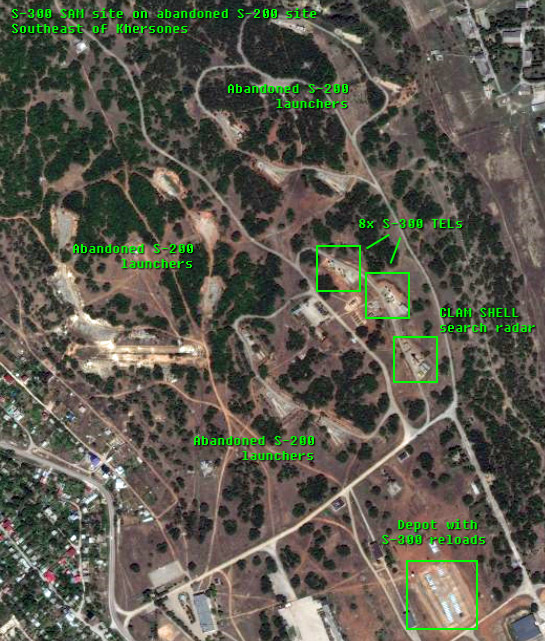 Zooming in on Crimea, we see the peninsula is populated with strategic assets. 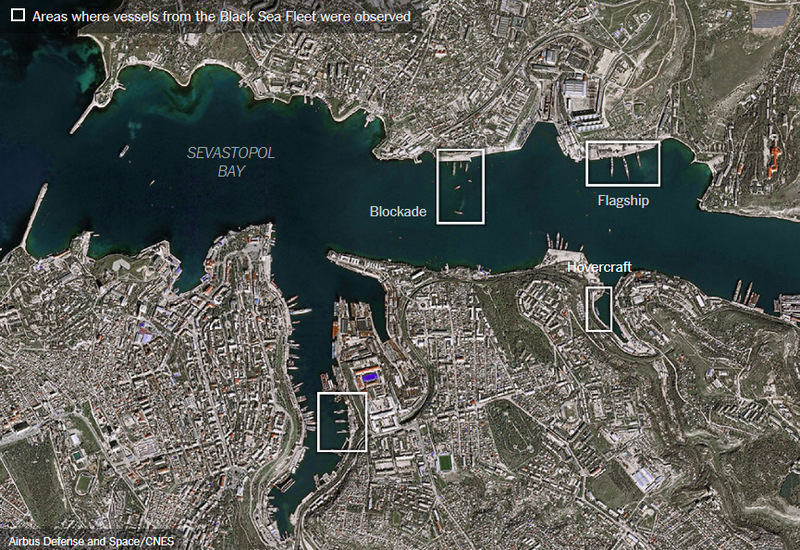 The fleet base at Sevastopol is tagged in Cyan. 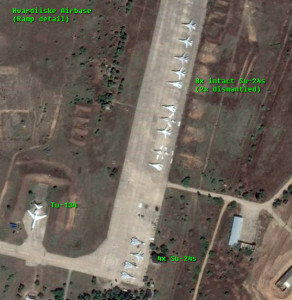 Airbases are tagged in green. 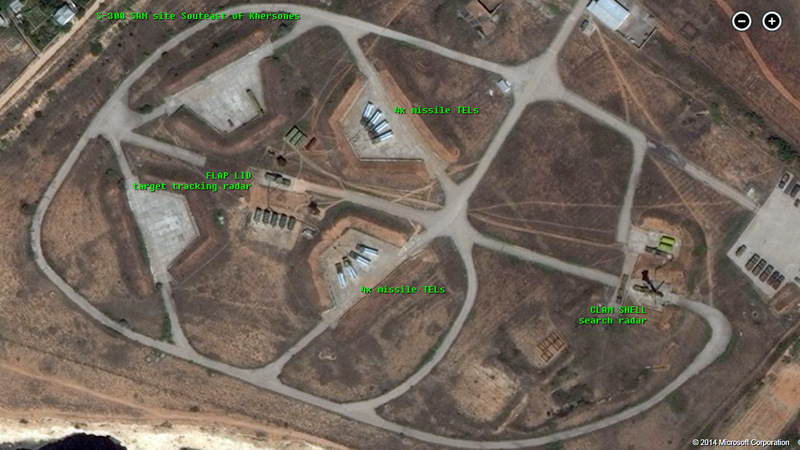 S-300 surface to air missile units are tagged in red. 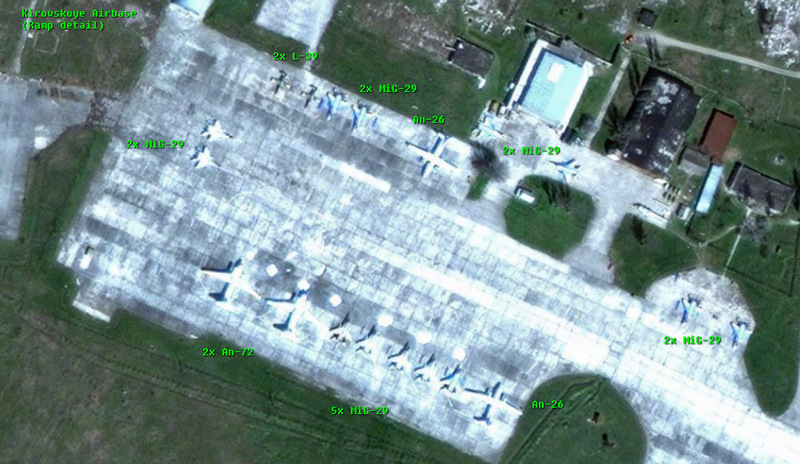 Active Ukrainian airbases include Balbek, just north of Sevastopol, with Sukhoi Su-27 and MiG-29 fighters, and Kirovskoye in the east of the country, with MiG-29s. A Ukrainian anti-submarine aviation unit is based at Saky Airbase on the west coast, with Beriev Be-12 seaplanes and Kamov Ka-27 helicopters. 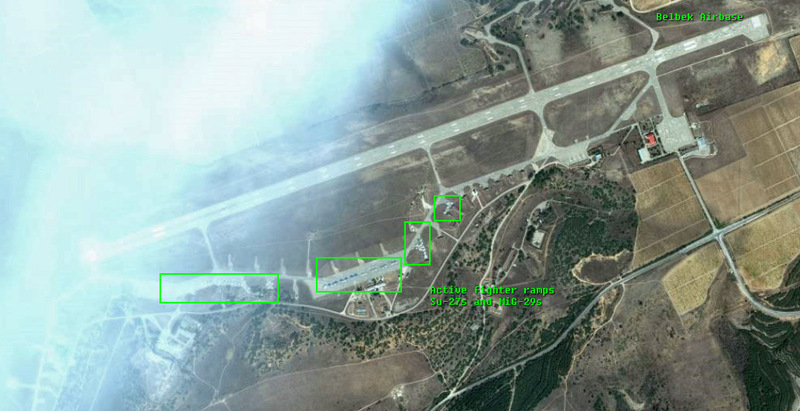 The Russian navy bases a squadron of Su-24 anti-ship bombers at Hvardiiske Airbase north of Simferopol International, as well as composite anti-submarine and transport regiments at Kacha Airbase north of Belbek. 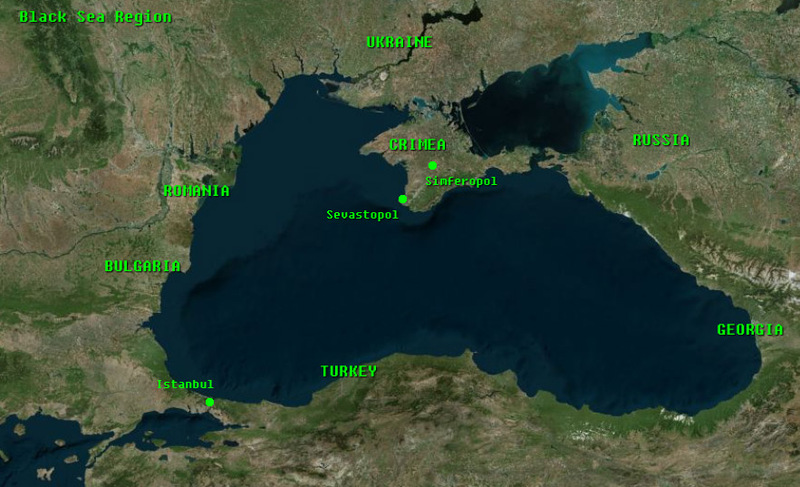 Here is a magnified view of the northern side of the fleet harbor, with some of the major units of the Black Sea Fleet. The Slava-class missile cruiser Moskva has heavy anti-ship and anti-aircraft capabilities and while built during the Cold War, is still likely the most powerful naval unit in the Black Sea. During the US-Syrian crisis in 2013, the Moskva was sent to Syrian waters to shadow the US fleet. 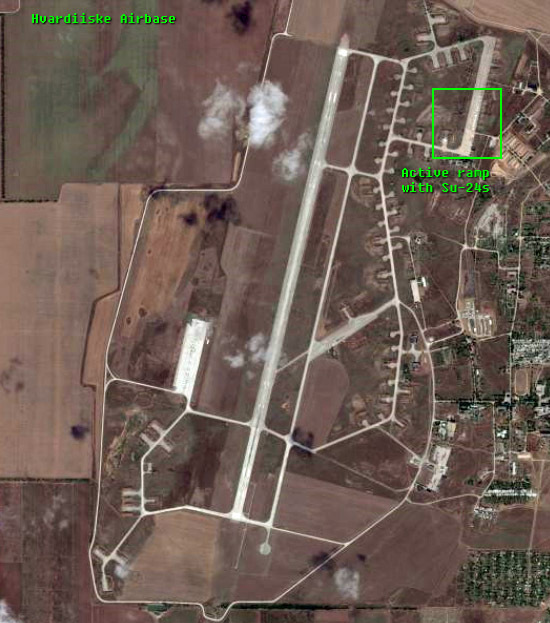 The Khersones Airbase west of Sevastopol no longer appears to be in use. The big Dnepr space surveillance radar on the western shore was once a major strategic asset for the Soviet Union, as it was built to provide early warning of a nuclear missile attack from Mediterranean-based American fleet ballistic missile submarines. What look like the building’s ‘wings’ are actually two faces of the giant phased array radar. The radar continued to operate after Ukraine took it over in 1991 and provided space surveillance data to Russia in exchange for Russian funding. The site reportedly went off the air in the mid-2000s and appears to be in poor condition now. Besides the Black Sea Fleet, the Russian Navy also has some aviation assets in Crimea, including the 43rd Independent Naval Shturmovik Squadron armed with Su-24 fighter-bombers outfitted with air-launched anti-ship missiles. 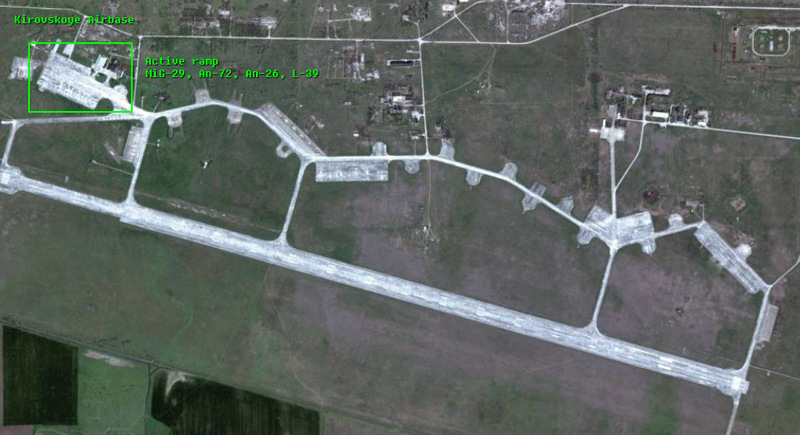 The squadron is based at Hvardiiske Airbase north of Simferopol International Airport. Below is a closer view of the active ramp at Hvardiiske Airbase. When I flew into Simferopol in 2005, I was staring out the window as my Tu-134 airliner descended, and was surprised to get a close look at Hvardiiske and a bunch of Su-24s lined up on the tarmac. 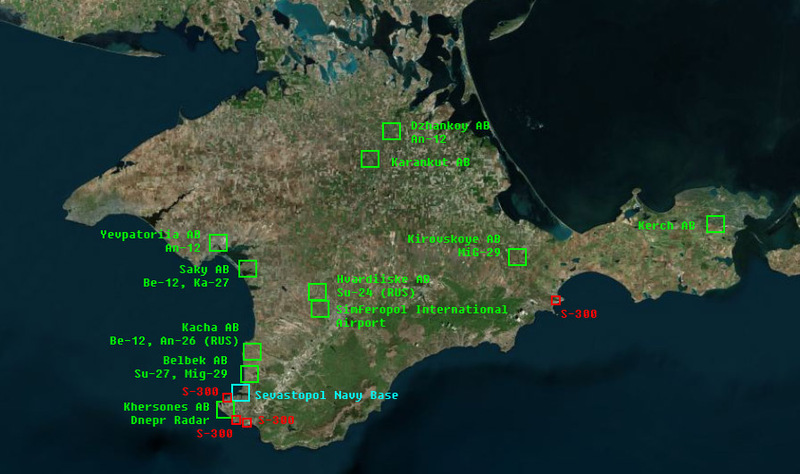 Now let’s look at Ukrainian ground-based air defenses in Crimea. 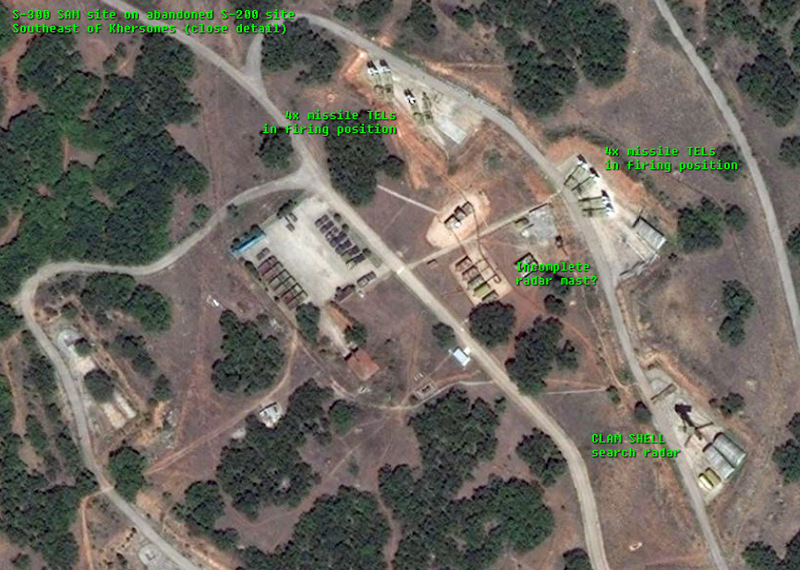 I was able to identify four S-300 SAM sites, three defending Sevastopol and one further east near the port of Feodosiya. The BBC is reporting tonight that Russian forces have surrounded a Ukrainian SAM unit in Yevpatoria, but I was unable to find an S-300 site there. It could be the unit had not deployed into firing positions and would be difficult to spot from satellites. On paper, the S-300 is a very capable anti-aircraft system with a maximum range between 90 and 200km, depending on the missile type, and limited anti-ballistic missile capability. The Ukrainian S-300s are likely to be older models and less capable than the newest versions now being produced in Russia. Given that it is a Russian-designed system, presumably the Russian air force is also aware of and would be able to exploit any weaknesses of the S-300. Each S-300 site has a long-range search radar (Ukraine uses the NATO-codename ‘CLAM SHELL’ radar, usually mounted on a mast to increase its range against low-flying targets) and a target tracking radar (Ukraine uses the ‘FLAP LID’ radar, either on masts or vehicle-mounted). There are also always several command and generator vehicles at each site. Each site controls a number of Transporter-Erector-Launcher (TEL) vehicles, each of which carries four missiles. A common configuration uses eight TELs for 32 rounds ready to fire. Clearly, both Ukraine and Russia consider Crimea a strategic priority, and placed significant assets there to defend the peninsula from external attack by air or sea. The fact that the armed standoff taking place in Crimea is between Russian and Ukrainian ground forces is something of a bitter irony. Russian troops have spent the last few days securing strategic assets throughout Crimea, including the parliament building in Simferopol, Simferopol International Airport, other airbases, and as of Sunday were surrounding Ukrainian military bases and asking Ukrainian troops inside to disarm themselves. 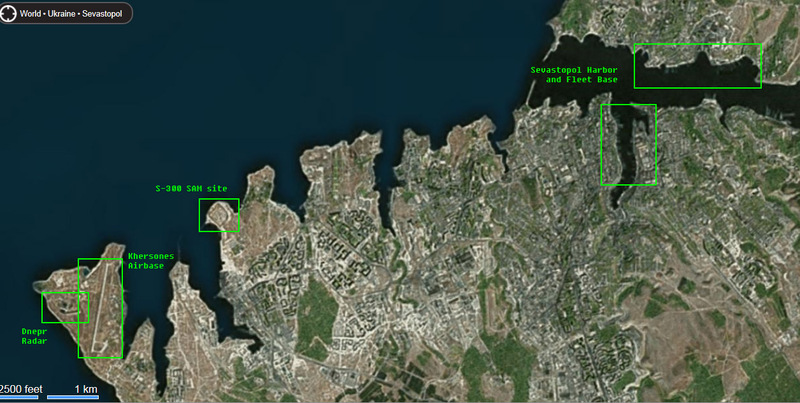 Several sources report that the initial wave of Russian troops may have come from the Sevastopol Fleet Base, but that additional troops are being ferried in by Russia. Analysis: President Putin is taking advantage of the chaos in Ukraine to cement Russian control over the majority-Russian and heavily militarized Crimean territory. I believe it is unlikely that political pressure alone will convince Putin to withdraw his forces. The referendum on Crimean autonomy is likely to succeed, given that a thin majority of the population does identify more closely with Moscow than with Kiev. The outcome could be outright secession from Ukraine, or Crimea could claim greater autonomy, while remaining part of Ukraine administratively. Crimea is too small to succeed as a completely independent state with its own currency and foreign policy, so full autonomy would likely come at great economic cost to the territory’s residents. None of the other pro-Russian autonomous territories in the region, like Abkhazia, South Ossetia or Transnistria have well-functioning economies, economic integration with other countries, or good standards of living for most residents. This is a case though where political passions win out over economics. Russia may also face some political and economic costs, as Secretary of State John Kerry said Sunday that Russia will lose foreign investment and may be removed from the G-8 economic group. Crimea and the Black Sea Fleet base at Sevastopol are critical strategic assets for Russia however, and Putin may believe that more direct control over Crimea is worth any pain the international community can inflict. Flight tracking site FlightRadar24 reported an hour ago that civilian air traffic is avoiding the closed airspace over Crimea. 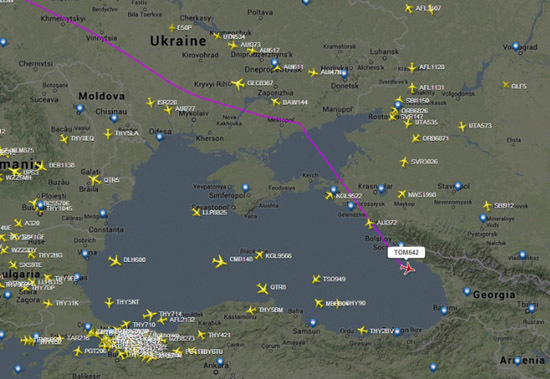 An Aeroflot flight did depart Simferopol airport on time last night, even though troops occupied the airport.